Centurion, by O.C. Shaw. Smashwords; 2015. 247 pages. Ebook. Release Date: March 26th, 2015. "After witnessing his mother’s death, Gabriel Smith finds himself orphaned and surrounded by strangers. 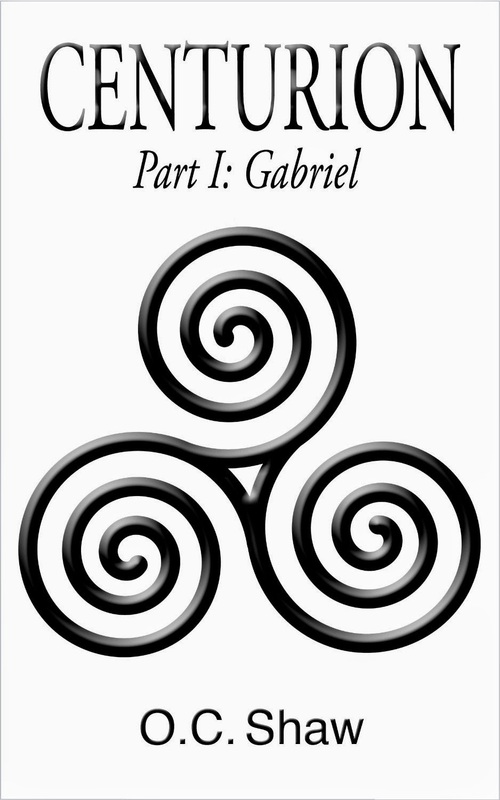 Under the guardianship of an uncle he had never heard of... Gabe struggles to deal with the loss of the life he knew, and embrace his new life with the 'Centurions'. Thrown into the centre of a prophecy, only his friendship with Emma gives him the strength he needs to face his future. " I have extremely mixed feelings about this book. On the one hand, it was extremely unique, detailed, and interesting. On the other hand, I felt the writing itself lacked overall emotion and character. First off, I must say 'bravo' to the author for creating a world that combines fantasy/magic and reality in a very fluid manner. Her writing style is really quite flowing and engaging, and the back story that she has created for the Centurions and how they interact with the non-magic humans is extremely interesting (although, I won't lie, I did skim a few parts that seemed to drag on just a bit too long...). I found it extremely fascinating how she relates that mass deaths in history, such as earthquakes, are actually the result of "Feeders" that have wreaked havoc. However, one area that could use some work is the setting of scenes. Where Shaw did a marvelous job of describing the history of Centurions and other details, she fell short on describing the actual location where events were taking place. What I mean by this is that it was sometimes hard for me to picture exactly where they were or what was going on. There wasn't much movement or life brought into these scenes (this notion is further expanded upon when I discuss the characters). Despite this, the novel truly soared in areas of action and imagination, and I truly enjoyed the story itself. Now, on to the characters: I really feel that the characters could use a little work. While they all maintained a fairly unique personality, they were still just a bit too generic. There wasn't very much development, and they just seemed to lack that little spark that really brings a character to life. They had moments of great charm and personality, but also many moments where they turned somewhat mechanical. In reference to my earlier remark about a lack of movement, the characters did not have much.. reality in their conversations. I personally enjoy reading conversations and seeing characters "glance down shyly" or move their arms about. I'm not sure if this makes much sense, but there just wasn't enough personality and life given to these characters. Overall, I'd say give it a shot. It took a little while to get started, but once it gets going it really is quite entertaining. It was hard for me to decide how many stars to give this one. At times, I really enjoyed it, but there were also a lot of things that bothered me about. Because of that, I'm going to go ahead and give it three stars.